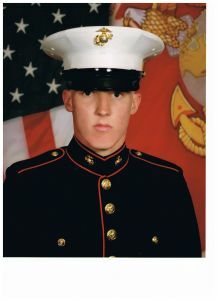 The Round Lake Area Exchange Club along with sponsor Dr. Connie Collins of RL School District 116 are proud to announce the March Hometown Hero; U.S. Army Private First Class James Geraghty, a Fox Lake resident and 2011 graduate of Grant High School. Geraghty was registered for this honor by his aunt, Cynthia Tomusiak also of Fox Lake. He is training to be tow gunner and will be at Camp Pendleton, California for at least the next 17 months. He has earned the National Defense Service medal and Expert Rifleman. Hometown Hero Project Chair, Sherry Ridge, will be filling his Hanging with the Heroes care package with beef jerky, cashews, chocolate, power bars and with the help of our sponsor Dr. Collins a variety of DVD movies. All “Hanging with the Heroes” care packages are delivered with a personalized “Hanging with the Heroes” t-shirt (donated by Artrageous of Hainesville), a piece home and letters from Round Lake Area School District 116 students. Postage for sending the care package is covered from a donation to the Hometown Hero project made by Avon Township. The Club presented a plaque on behalf of the March Hometown Hero to his family at their meeting on March 28.